Fantastic news, Lilyians, we finally got more information on the photoshoot released a while ago of Lily for Paper magazine! The digital magazine has revealed that Lily was their April cover and along with the revelation, we were blessed with more outtakes and an interview that you can read below! 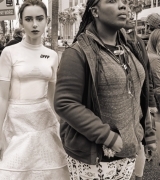 Ahead of playing one of the biggest parts of her career — Fantine in BBC’s upcoming Les Misérables — we cast Lily Collins in a new role as a mythical angel of Hollywood, flitting unseen through the streets of Los Angeles while giving young, starry-eyed hopefuls some divine inspiration. Sitting down with Digital Spy, Lily tells the publication about how she walked into the audition room and in the end, secured her role as Cecelia Brady in The Last Tycoon. A very short talk, where she also discusses the appeal of picking TV roles over movie ones, and you can read all about it bellow! Lily Collins has suggested that her lifelong obsession with old-Hollywood glamour was pivotal in securing her a role in Amazon Prime’s 1930s drama The Last Tycoon. The actress plays “go-getter” Cecelia Brady in the TV adaptation of F Scott Fitzgerald’s last, unfinished roman-à-clef, which follows the ambitions of young executive Monroe Stahr (Matt Bomer) and his power struggle with studio boss Pat Brady, Cecilia’s father (Kelsey Grammer). Written and directed by Oscar-nominated screenwriter Billy Ray (Captain Phillips, The Hunger Games), the series also captures an era darkened by the Depression and the growing influence of Hitler. The series has recruited a team which includes Oscar-winning production designer Patrizia von Brandenstein, and Emmy-winning costume designer Janie Bryant (Mad Men) to bring Hollywood’s golden era to life. Collins also discussed the appeal of picking TV roles over movie ones, saying there’s longer to “flesh out” a role, and an excitement at not knowing what will come next for your character. “You have so much time to flesh out a character and you get to spend more time with the people you’re working with, and develop relationships on camera that you would have to beat along in a film,” Collins continued. The Last Tycoon is available exclusively on Amazon Prime Video from July 28. USA Today wasn’t the only publication Lily spoke to while doing press for To The Bone. Harper’s Bazaar was another publication that Lily spoke with, in which she is questioned about how she did research for the movie, the key factors that helped her recover from the eating disorder and what advice would she give anyone who’s suffering from it. Playing an anorexia victim would be a challenging role for any actress, let alone if they’ve suffered from an eating disorder in the past. Lily Collins took the risk when she took on To The Bone, which stages the journey of a young woman battling with anorexia as she enters a group rehabilitation home. Directed by Marti Noxon – best known for her producing and directing work on TV series Buffy the Vampire Slayer – the film is part autobiographical, rendering it more accurate than former, more simplistic screen representations of the disorder – there are secret sit-ups in the dead of the night, xylophone chests and animal-like cries of the truly tormented. Although expectedly disturbing in parts, it’s also flecked with a dark humour that was important to both Collins and Noxon. Collins herself lost a huge amount of weight for the part and, harrowingly, was even complimented on her appearance – a dangerous situation to be in for someone who has fought an eating disorder in the past. However, it’s exactly reactions like these that prompted her to sign up to the film – which at that point didn’t even have a distributor. Ahead of the film’s Netflix release on Friday 14 July, we talked to Collins about the project and how it helped her come to terms with her own relationship with food. Given your history, did you have any reservations about taking the role on? Lily sat down with USA Today recently, where she spoke about why she chose to take on the role of Ellen in Netflix’s anorexia movie, her own experiences and much more. You can read the whole interview bellow! BEVERLY HILLS, Calif. — In Netflix’s new anorexia movie To the Bone (streaming Friday), Lily Collins’ character Ellen has a compulsive habit of measuring her tiny arm. The young woman wraps her thumb and middle finger around her barely-there bicep to check that her fingertips meet. They usually do — that’s how sickly she is — and indicate how small Collins chose to get for the part. Beefing up and slimming down for roles is all part of the job of an actor. But for Collins, 28, there was an added danger: She wanted to look like someone with anorexia, years after overcoming her own disordered eating, which included consuming nearly nothing, using diet pills and throwing up. That meant looking thin enough to worry her fans, who “lovingly, were concerned” after seeing the actress in paparazzi photos taken while she was preparing for the movie. She won’t disclose how much she lost, “but I was held accountable by a nutritionist, by (our director), by my mother, by our producer,” she says. TORONTO – Lily Collins says she’s long been fascinated with food documentaries and mindful about what she puts on her plate. “I’m not a red meat eater currently, I haven’t been for a very long time,” says the Golden Globe-nominated actress, who is the daughter of singer Phil Collins. But shooting the new Netflix film “Okja,” about the strong bond between a South Korean girl (played by Ahn Seo-Hyun) and her genetically modified “superpig” created by a livestock company, added a new level of resonance for her. Director/co-writer Bong Joon-ho’s fable, which also stars Tilda Swinton and Jake Gyllenhaal, hits Netflix and Toronto’s TIFF Bell Lightbox on Wednesday. The Canadian Press spoke with Collins about her character, who is a member of an animal rights group that tries to free the animal and hundreds of other superpigs from being killed at a factory farm. Swinton plays two characters — sisters who lead the family-owned multinational conglomerate that created the pigs — while Gyllenhaal plays a TV zoologist working on behalf of the company. So this is your first Cannes! Yes, it’s so fun, but it’s so much. There’s really never a dull moment. it keeps you guessing— you’re like, what am I going to do next? What else can I fit into my schedule? Did Tilda Swinton or Bong Joo Hoo give you any advice about the festival before? Tilda was saying it’s going to be unlike anything I had ever seen. She told me to just soak it all in. I was talking to Paul and Jake about what happens after the premiere, when it all finishes— there is either clapping or booing, and you have a camera on you, and your seated in the center of the cinema. They were prepping me on when that might happen, so when the credits finished I was gearing up. It’s the strangest thing, all of a sudden the camera films you to witness the audience’s response. And I just looked at my co-stars, like ‘This is so strange!’ It’s like a fish bowl; you’re in the middle of the theater. Director Bong has been on the jury before, and Tilda, Jake [Gyllenhaal], and Paul have too, so they’ve been giving me some pointers. I’ve also been running into people at the festival that I know, who have been so helpful in reaffirming the fact that it’s mental. If one look at Lily Collins’ Giambattista Valli gothic ballerina dress, paired with a blunt, black, bobbed wig at this year’s 2017 Met Gala didn’t have you swooning over the 28-year-old actress and her flawlessly executed fashion sense, you’re about to get a second opportunity to feel faint. When it comes to the reality of growing up as a young star in Hollywood, the pressure to be perfect, and her reason for playing determined, female characters on camera, Lily doesn’t mince her words. A day after revealing that former First Lady, Michelle Obama, had sent her a personal ‘thank you’ letter after receiving a copy of her book, Unfiltered, we sat down for a chat with the Golden Globes-nominated actress. In a brilliant ELLE UK + Lily Collins session, we covered everything from growing up in Hollywood, women’s perception of beauty, her singing skills and her latest film, Rules Don’t Apply. Let’s just say, the conversation didn’t disappoint. In Rules Don’t Apply, Collins plays chaste, Baptist 18-year-old beauty queen, Marla Mabrey, who moves into a Hollywood Hills house, paid for by American film director, Howard Hughes (played by Warren Beatty, who also directed the film) ahead of her screen test with the multi-millionaire, in the hope to find fame as a young actress. Throughout the narrative, Marla’s determination is frequently tested as she’s manipulated by producers, directors and her own family. However, while Marla is a headstrong teenager who isn’t afraid to stand up to her mother, Lucy, (played by Annette Bening) and Hughes, she’s also unafraid to show her frailty in the face of hardship – a quality Collins admires, greatly. The first time I saw my best friend after a year apart in 2002, I could barely see her at all. We were attached at the hip throughout high school, bonding over boy obsessions and SAT prep. But after we’d both spent our first college semesters apart (her in New York, me in Pennsylvania), we reunited and I didn’t recognize her anymore. She was half her size. Her hair was thinner. She had permanent goosebumps. She had a “cold” that didn’t go away for weeks. And she had a strange new way of ordering chicken in restaurants: no skin, no oil, no sides. While watching To the Bone, an upcoming Netflix film directed by Marti Noxon and starring Lily Collins (which premiered at Sundance earlier this year and sold to the streaming network for a massive $8 million), I immediately saw my friend in the lead character. Collins plays Ellen, a young artist reluctantly going through the motions of treatment for her severe anorexia. Her character’s baggy clothes, defiant nihilism, and habit of moving food around on a plate — it was all so familiar. What my best friend, Collins, and Noxon all have in common is a history of anorexia. Thankfully, all three have recovered, but that doesn’t mean making the film was easy for everyone involved. Below, my conversation with Collins and Noxon, including how Collins handled having to lose weight in order to play this part and the matching tattoos that sealed the bond between director and star.